Websites rule the internet and people visit them so frequently for countless reasons, so let’s be on our way to review what actually the internet archive “The Wayback machine” is about. The platform primarily serves as a mechanism to archive and access almost anything on the internet, while techies utilize it to save web pages, texts, audios and much more. The Wayback machine automatically archives several popular websites that they can be made available for prospective analysis. With an extensive database, it enables the users to save gray webpages to compare them or keep track of advancements after years, as it is insurmountable to keep all the favorite websites stored on the system. One might change the computing device, or the developers may obstruct or remove the webpage, in such conditions and many more, one will never be able to access the content that was once there. The service is competently permitting the students, teachers, entrepreneurs, scholars, developers, and browsing enthusiasts to look for an archive of the software, websites, audio, images, video, and text content and one can approach them anytime even after decades. In conjunction with this, only public sites are available to be archived; password protected pages can’t be saved or used for this service. Get along, and as the article rolls out, you will come across the significance of this service and how to utilize them in the best manner. On can access it using the browser, guilelessly type Wayback Machine and hit Enter to search for it. 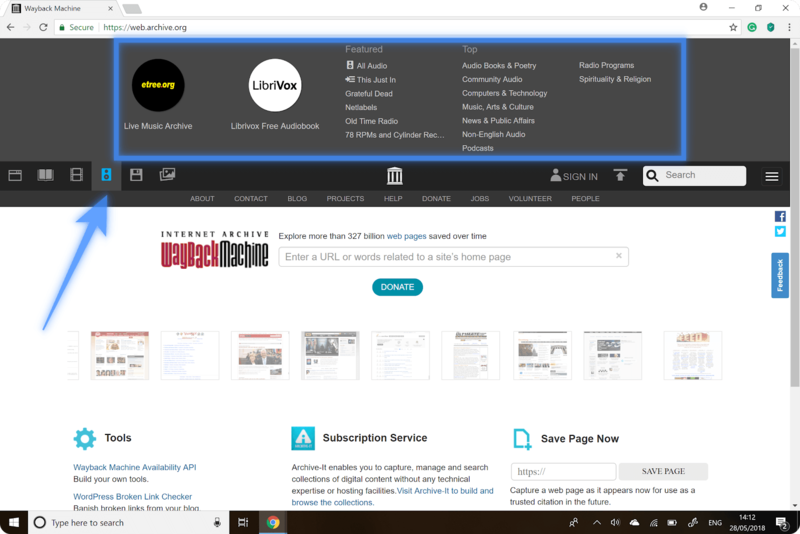 There are several toolbars and options available on the main page where one can filter the search results by using the icons available on the top left corner for the web, documents, video, audio, software, and images. These are quite helpful as they aid the user to save time by merely searching the right file or a webpage. However, if you do not want to get into any lengthy procedure or wandering around, simply paste the URL and get going back to the drawing board once after the Web site has been approached and you are all set to initiate using it. Follow the instructions stated below. First of all use search bar to find the specific site, paste the URL into the search bar shown in the picture above and click on the BROWSE HISTORY. Once after opening the Wayback Machine web site, there is an option available to save the URL, copy the URL you would like to add to the archive, paste it and hit Save Page. As soon as the Save Page button is clicked, it will take you to the new screen and will save the page in its actual condition so that techies may access it anytime from now on even after decades. Once saved if the page was archived earlier by any other users, you would be able to access the gray version of the website by choosing the date from the timeline. Simply, glide the cursor over the timeline and select the desired time. For instance, let’s say the webpage added to the archive was YouTube.Com, thus to have a look at, What Youtube looked like back in time, glide over the timeline click on it and it will load the page. As stated earlier one can search for the archived files by the category, for example, if you stand in need to search for an Audio File, simply click on the third icon from the top left corner as stated above, also, when the cursor will glide over and stop for a second it will show up text reading as Audio, click on it, It is absolutely same for other categories as well. However, when the users will look for software, audio, images, or text content it will be similar to the formerly described procedure, let’s take the above example, click on the audio icon, following illustration will be visible. Withal, finding the archived web pages is the most straightforward process, where techies are only required to paste the link and get going. Click on the first icon from the top right corner of Wayback Machine homepage. It will display a small search bar on the top of the screen. Paste/ Enter the URL, click Search. On the top of the page left-hand side of the toolbar contains an option which reads as SIGN IN, clicks on it if you already have an account for Wayback Machine, else, you will have to create an account/register, it is free. Click on Sign In; it will take towards a new screen. Under the statements “forgot your password?”, there is an option to “Register for Free,” Click on it. Enter details that are required, after verification you will be successfully registered on Wayback Machine. The webpage will deliver all the services even to the users who are not registered, but, if you are a frequent user, it is good to get an account to find the links that were previously saved quickly. Further, only the registered users are welcomed to upload them and avail the offers like Library card, write a review of the uploaded files, etc. Wayback Machine permits the users to download the archived audios, videos, images. Scroll down on the web page containing the file, on the right side of the page; there will be several options under the heading Download Options. Choose the one that suits you best; one can also procure torrent files for the archived images, audio or videos. There is a lot more to this web service; however, once the users get along with the basics, it will get easier to take advantage and make most of it. It is an ideal tool for those who are so into history and would love to compare how far the world has advanced, thus save the web pages, texts, audios, images so and so to have a look at them after years to compare or refresh memories.